Eli Manning's Super Bowl XLII helmet, which was central to a memorabilia fraud lawsuit filed against the quarterback in 2014, is going up for auction, ESPN reported Friday. 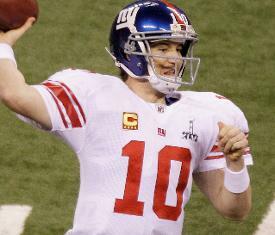 The helmet, which Manning wore while the Giants defeated the previously 18-0 New England Patriots in February of 2008, will be open for online bidding by Goldin Auctions starting Monday and awarded to the top bidder on Aug. 3. "This is a very significant piece," Goldin Auctions president Ken Goldin told ESPN's Darren Rovell. "Bidding for this will definitely surpass $130,000." That price would set a record for most paid at auction for a football helmet. The current mark is $126,500, paid last year for a helmet worn by Rudy Ruettiger at Notre Dame. The record for a Super Bowl helmet is $53,775, paid in 2012 for a helmet worn by James Harrison in Super Bowl XLIII. The Manning-worn helmet is being sold by collector Eric Inselberg, who brought a lawsuit against the Giants and Manning in January of 2014 after seeing another helmet being advertised as Manning's helmet from Super Bowl XLII. That suit, in which Inselberg alleged the Giants ordered a second helmet to be manufactured for a museum, was settled for an undisclosed amount shortly before the trial was set to begin in May. Other helmets deemed to be game-worn were also alleged to be falsely represented, per the suit. Inselberg says he bought the helmet that is going up for auction from Giants equipment manager Joe Skiba. Goldin is using photo matching from multiple companies to prove authentication for the sale.